What child doesn’t love a silly joke or a ridiculous scenario!? 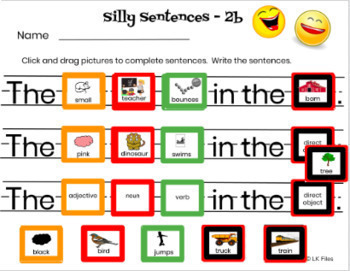 This digital activity provides a simple and effective way to teach young students parts of speech while creating silly sentences that will tickle their funny bone! Multiple cards provided endless opportunities for practice! ***BONUS - Paper template for children to write and draw pictures to go with each sentence. 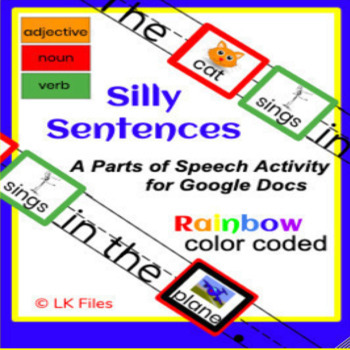 This file contains links to the 2 sets of silly sentences activities on google slides. Each activity has moveable pieces for students to complete the sentences. Successfully tested and used on chromebooks and ipads. 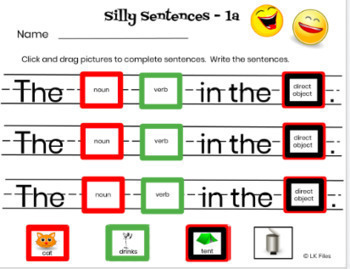 Child completes sentences on the page by clicking and dragging color coded cards to appropriate space. Move cards not being used to “garbage” bin to keep page organized and neat. When assigned page(s) is complete, children write sentences on paper and draw a picture to match each one using the bonus template provided. When purchasing this product, open file using google drive. You will get a link to make a copy of each google doc. Open your own copy of the activity and it is ready to share with students! Shared devices: You can open a copy on each device you plan to use in centers for students to complete. No need for students to have individual accounts. 1:1 devices: You can send directly to your student accounts for each child to complete. ***These are digital activities. You must have a working knowledge of using google drive, google docs, and google slides in order for this to be successful in your classroom. punctuation - practice using capital letters to begin a sentence and periods at the end. Preschool Kindergarten- Great opportunity for emergent readers to transition to reading sentences with basic sight words of “the” and “in” and words with pictures. First Grade - Introduce and reinforce Parts of Speech in a fun and effective way: adjective, noun, verbs. Great way to practice letter and word spacing in a sentence to sharpen handwriting skills. 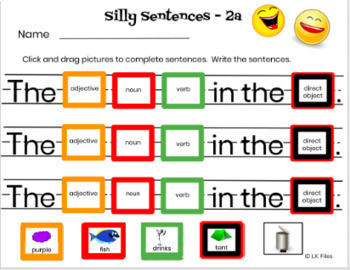 Second Grade - Reinforces Parts of Speech: adjective, noun, and verbs and adds grammar lesson on Parts of a Sentence: subject, action verb, and direct object. Total of 24 different cards of each adjectives, nouns, and verbs. Many silly and fun opportunities to practice these important skills! Children love reading and sharing silly sentences with one another. If you are interested in an activity shelf version of this product, please click on the link below.